Life is magical with its ever-changing phases. 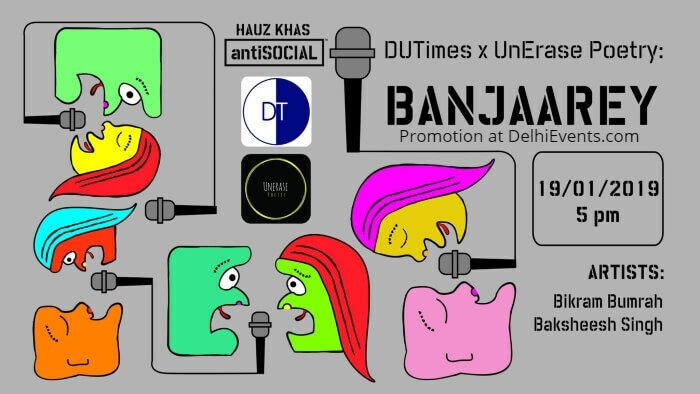 Come and join DU Times and UnErase Poetry in a congregation of people who don't conform as two misfit wanderers express their stories in a single act of music and poetry. Bikram Bumrah - Hailing from Punjab his Punjabi/Urdu poetry is inspired by poets from both sides of the border. Bikram is currently one of the most popular and versatile artists in the Bombay circuit and beyond. Drawing his inspiration from elements of nature and human emotions, his piece "Jaam" has become a rage with the youth. He has performed at various colleges and literature festivals in India. He has worked with UnErase Poetry, Spill Poetry, Under 25, Irshaad, RadioCity Freedom etc. Bakshish Singh - He is a singer and songwriter from Delhi. Born in a Sikh family, studied in a Christian school, listening to Pakistani bands and living in a country with a majority of Hindu population, he believes he has the liberty to create music breaking all boundaries. "Lets Jam" is his favorite question.